I walked up three stories of Central Library marble staircases, across woolen carpet woven with roses, to reach “Get It On Paper,” an exhibit reflecting on 20 years of Street Roots, curated by Portland State University’s public history program. Since this past summer, Professor Patricia Schechter and students Tanner Tombleson and Meg Shuhosky have thumbed through boxes in the Street Roots basement, sorting through Pride March tiaras, old vendor badges and poetry zines – reading Street Roots history, newspaper by newspaper. It all came together this spring in an exhibit that runs through May 5. I visit the exhibit from time to time, grounding myself in the steadiness of Street Roots — it’s always been the newspaper, the vendors, the commitment to advocacy. Recently, we launched a big new advocacy effort, the Portland Street Response, a call for non-police first responders to show up for non-criminal 911 calls. But we’ve been doing advocacy since day one, always linked to both journalism and people struggling with homelessness and poverty, including those who sell Street Roots. In 1999, there were a handful of vendors; in 2019, about 170 vendors sell Street Roots each week. Walking from the front door to the third floor of Central Library, I passed five Street Roots vendors. The library is a refuge for people for whom so few spaces are available. Public spaces are essential for the poorest people in our city who are priced out of safe and stable places to live. When crises emerge, it is the librarians who assuage people, who make space for them – likewise it is the bellhops in front of hotels, the park rangers and the Street Roots workers. I walk from case to case. Honoring the centrality of words at Street Roots, each exhibit case displays one word printed on a bright placard. Bridge. Human. Family. Roots. House. Open. Love. Tell. 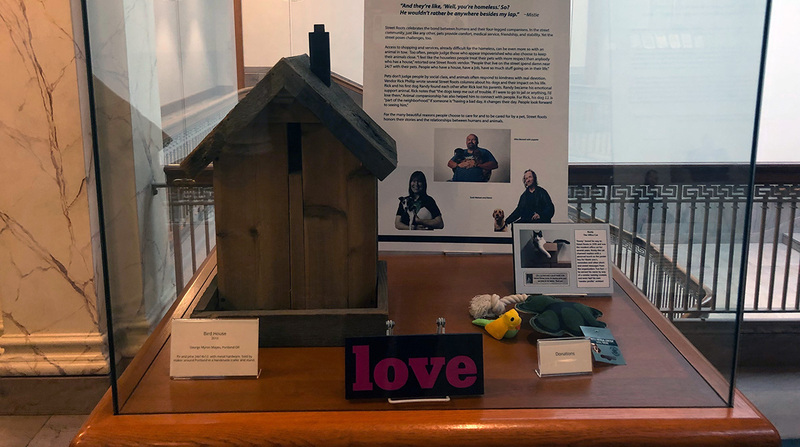 The “love” display in the “Get It On Paper” exhibit at Portland’s Central Library features a birdhouse built by former Street Roots vendor George Mayes. There’s the birdhouse built by the late and beloved vendor George Mayes. The cut-paper portrait created by Olympia artist Nikki McLure that illustrated the first weekly edition of Street Roots in 2015. There’s “Fallen off the Edge,” the memoir that Art Garcia wrote by compiling his Street Roots columns. A photograph of Burnside Cadillac founder Sharon Pearson with Street Roots founders Bryan Pollard and Michael Parker. There’s the issue when Parker, Pollard and Israel Bayer covered the World Trade Organization protests of 2000 in our early days of groundbreaking journalism. There’s the description of Street Roots’ role in founding Dignity Village, opposition to restrictive sidewalk laws, the campaign for saving the social safety net, and the founding of Welcome Home Coalition, which worked to pass the Portland Housing Bond and the Metro Housing Bond. Advocacy is rooted deep with Street Roots, stronger because of the role of the newspaper and the vendors. Street Roots journalism pushes civic dialogue for an enlivened democracy and then shares that journalism by wire service to 100-plus street newspapers internationally. And whatever advocacy takes place, Street Roots vendors make clear what’s urgent. That’s the pulsing heart of this organization – the people, 365 days a year. If we give up the fight, the struggles are still there. So much happens right in front of us; lives thinly threaded to survival. This week began with one man having a seizure in our office; another, we learned, was injured, hit by a car. We are ending this week with a memorial – a gathering with our friends at Sisters of the Road to memorialize the glamorous, witty, kind Francine Parks, whose recent death has sent scores of us mourning. We were fortunate at Street Roots to count her among our vendors, and sadly among too many we’ve lost in the past year. But that loss serves to underscore our commitment to fighting for the lives of people still on the edge. This week, as with others, there are some triumphs, too. A vendor told us about how a customer helped him secure a job in a restaurant. Another vendor moved from the streets to a shelter, the dark circles under his eyes a little less pronounced. Every week since the beginning has been like this at Street Roots — the lives of the vendors inform our journalism and advocacy. The newest phase of advocacy, Portland Street Response, might be bold, but we will not give up, because we hear the need every day. One vendor described to me how when he has a mental health crisis on the streets, sometimes his “brain just can’t stop itching,” and the last thing he needs is someone aggressively approaching him with a gun. “I need a soothing voice,” he said. Maybe creating a new street response plan is bold and new, but its roots – like our own – reach back decades. “20 Year of Street Roots: Get It On Paper” will be on exhibit at the Central Library through May 5, with a Street Roots vendor poetry reading at 2 p.m. Sunday, April 14. We will continue to mark our 20th anniversary throughout the year. Save the date for the Street Roots Street Party on Aug. 17!